Last week was full of news. First, Royal Caribbean announced that it was selling Celebrity Cruises’ Century to a newly formed subsidiary of China’s Ctrip. This was followed by various rumours from China, but not from Royal Caribbean. On the same day, although rumours had been circulating for some time of the acquisition of Prestige Cruise Holdings, owners of the Oceania and Regent brands, by Norwegian Cruise Line, the deal was finally announced. From Australia came word of the cancellation of Funchal’s short 2015 season, and then from France confirmation that the Zenith would remain with Croisières de France as the Century was now going elsewhere. Royal Caribbean Cruises Ltd announced last week that it had entered into an agreement to sell Celebrity Cruises’ 1,814-berth cruise ship Century to Exquisite Marine Ltd, a holding company held by Ctrip.com International Ltd. Ctrip is a major Chinese online travel agency that says it now sells 10% of all cruise tickets sold in the Chinese market. The selling price has been estimated as $157 million and the sale will result in a non-cash loss of approximately $20 million dollars to Royal Caribbean, which will be excluded from adjusted net income in the company’s third quarter results. Celebrity will continue to operate the Century until April 2015. Exquisite is a wholly owned subsidiary of Skyseas Holding International, a company co-founded by Ctrip and other investors to target Chinese customers with world-class and tailor-made cruise products. Ctrip also said it had entered into a memorandum of understanding with Royal Caribbean to form a joint venture to manage the operation of the acquired cruise ship and potentially to broaden the relationship. Liang Jianzhang, Ctrip ceo, is on record as having said that it planned to enter the cruise sector and sees this as an important future strategy for the company. It recently expanded into Korea, establishing a branch there just last month. According to Ctrip vice-chair Min Fan, the company has sent over 120,000 guests on cruises to date and has a 10% share of the Chinese cruise market. That would be enough to fill the Century for about fifteen months. 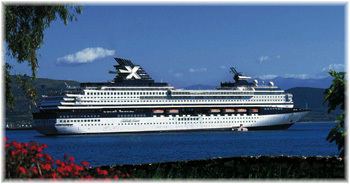 Century was built by Meyer Werft in Papenburg, Germany, and joined Celebrity Cruises in December 1995. Until now, it had been intended that she would be transferred to Pullmantur’s Croisières de France operation in April. In recent weeks, other rumours originating in China have seen Ctrip saying they “were in talks” to acquire the 1,900-berth Mein Schiff I and Mein Schiff 2 from TUI Cruises, a joint venture of Royal Caribbean and German travel company TUI. These two ships were built as the Galaxy and Mercury, the second and third of the Century class that were built to a slightly longer length overall. 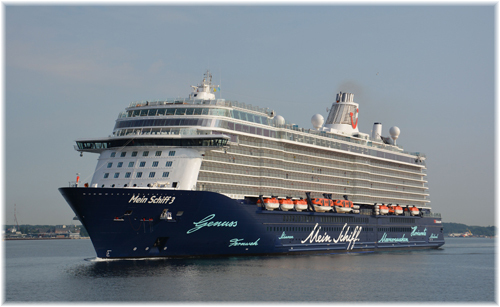 TUI Cruises took delivery of Mein Schiff 3, the first of four 2,500-berth newbuildings, this year, with others to follow in each of 2015, 2016 and 2017. Nevertheless, one is never to know just when one or both of the former Celebrity ships might become surplus to requirement at TUI. Meanwhile, as well as having based its 3,114-berth Explorer of the Seas and Voyager of the Seas in China on a seasonal basis, Royal Caribbean has allocated the new 4,180-berth Quantum of the Seas to be based in Shanghai year-round starting in 2015. Last week, Norwegian Cruise Line announced that it would pay just over $3 billion in cash and shares to acquire upmarket Prestige Cruises International. After the announcement, Norwegian shares rose 13% before closing at $33.19 on Friday. Our comparison shows the share price against Facebook, both stocks having gone on the market at similar prices last year. The sale price is said to be set at eleven times earnings before interest, taxes, depreciation and amortisation. The big winner is Apollo Global Management, which acquired a majority stake in Prestige in 2007. Should certain performance targets be reached, Apollo will get another $50 million in cash according to terms of the sale. Of the two other big Norwegian shareholders, Genting Hong Kong and TPG Capital, Genting realized a gain of $152.6 million from selling Norwegian shares in March. Genting currently holds a 28% stake in Norwegian, while Apollo has 20% and TPG 7.9%. Apollo owns 59% of Prestige. Prestige operates Oceania Cruises and Regent Seven Seas Cruises. The agreement will give Norwegian access to Prestige’s eight ships and 6,450 berths, plus a ship now building for Regent, and its upmarket cruise offerings. 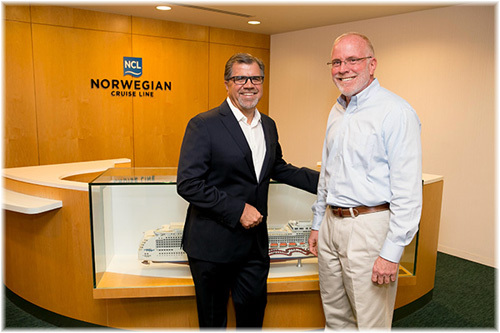 Norwegian owns 13 ships with 34,500 berths and is building four more of its largest size. These will add 16,800 berths, growing Norwegian’s Capacity by almost half to 51,300. The acquisition adds to Norwegian’s premium market operations a presence in the upper premium market with Oceania and the luxury market with Regent Seven Seas. The new expanded Norwegian will be looking for new cross-selling opportunities, cross-brand collaboration, cross-business support, as well as joint partnerships. In one area, Oceania and Regent already share their itinerary planning. It is not uncommon for one Regent ship and one Oceania ship to sail almost exactly the same itinerary, particularly on positioning voyages, with one ship offering its all-inclusive pricing and the other its upper premium pay-as-you-go product starting with a lower fare. A drinks package on Oceania, for example, can add more than $400 per person to the cost of a 7-night cruise. It is unlikely that mass-market Norwegian will gain anything in terms of itinerary planning however. More likely areas of synergy will be ship management and supervision, port operations and agency, buying fuel, victualling, purchasing and logistics and other back office functions. There will also no doubt be an attempt to keep more business “in house” when crossing markets. A good example is the couple who cruise Regent on their own but book Oceania or Celebrity when taking the family. They may now be attracted to consider Norwegian’s ship-top villas, which can offer a good deal for groups. Equally, Norwegian clients might now be tempted to trade up to either Oceania or Regent instead of Azamara or Crystal. 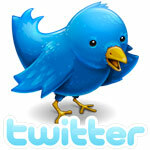 The more difficult conversions, however, may be those couples who like to take the whole family on Celebrity. With the amount of uncertainty in some markets, and a recent lack of growth in others, there have recently been a couple of announcements that never came to fruition. From Australia last week came word that Portuscale Cruises had been forced to cancel its short 2015 Australian season with the 480-berth Funchal. She was to have performed a 44-day liner voyage from Barcelona to Newcastle NSW. She was then to have positioned to Geelong, in the state of Victoria, for a short month-long season in Australia before undertaking a 56-night return voyage from Newcastle NSW to Portsmouth. Seeing as Cruise & Maritime Voyages had been offering “two for one” fares and later half off the second passenger on its November sailing by the Astor from Tilbury to Fremantle via Cape Town, it seems that that ship was not yet full either despite a much longer lead time. It would appear that the decision came from head office in Lisbon and that she may cruise closer to home, sailing from Lisbon to Portuguese islands in the Atlantic instead, at least for this year. The withdrawal of the Funchal will no doubt help the Astor’s season. As of this morning, meanwhile, the Croisières de France website was still advertising sailings on its new Century, originally to have been transferred in from Celebrity Cruises. But now that her sale has been announced to Marine in China, she will make her last Celebrity cruise from Dubai to Singapore next April instead of from Dubai to Rome, which will place her in the hands of her new Chinese owners. The reaction in Paris and in the head office of Pullmantur in Madrid, who oversee Croisières de France, must have been interesting. But it also makes one wonder whether Royal Caribbean-owned Pullmantur is producing the goods in terms of traffic, revenues and yields. We know the Spanish cruise market has been shrinking and that Costa Cruises is closing down its own Spanish brand, Iberocruceros, but this cancellation of a transfer of another 1,800 berths to Pullmantur seems to indicate poorer prospects for both its brands than might have been expected.